Got a Home Air Filter Replacement question? We have the answer. If you can’t find what you are looking for here, we are just an email or a phone call away. What is Simple Filter Plan? Simple Filter Plan is an air filter delivery service. Instead of having to remember to change your air filter every few months, we deliver the filters you need right to your door. Why use an Air Filter Subscription Service? When was the last time you changed your air filter? For many of us, that answer is several months ago at best. Using a home air filter replacement subscription service means there is one less item on your to-do list. Simple Filter Plan allows you to protect your family, save money, and enhance your AC system, without even having to think about it. Every 30-90 days. We’ve been in the AC business for over 20 years, so we feel confident recommending that for the average family, you should change your filter once every three months. All of our plans start at 90 days, but can be adjusted to deliver your filters every 30 or every 60 days. If you have pets, if you smoke, or if you suffer from allergies or asthma, we recommend switching out your filter more often. Not sure what’s right for your home or family? Give us a call and we can make a more personal recommendation. A dirty air filter is the #1 reason for HVAC system failure. Changing your air filter extends the life of your AC unit. A dirty filter makes your AC work harder and longer, which means it uses more energy. Replacing your filter is a easy way to reduce your energy bill. A dirty air filter reduces your home’s air quality. Changing your filter can keep allergies and asthma at bay. A dirty air filter isn’t eco-friendly. Replacing your filter saves energy and reduces your carbon footprint. Changing your filter is great for your wallet, your family, and your environment. If look at your current filter, you can typically find the size listed on the side of the filter. If you can’t find the size listed, you can measure your filter or the space it fills. Most filters range from 8″-36″ in length or width and are typically 1″ thick. Measurements are usually Length x Width x Thickness. Remember, if you have multiple filters in your home, you will want to check or measure each one. Your air filter can be found inside return vents in your home. The return vent is typically right next to your furnace or air conditioning system air handler. The air handler pulls air in from the house through the return duct system, and then blows the air back into the house. You can typically find your filter at the point where the return duct enters the air handler. Look for a 1” wide hinged or removable cover. The air filter will be inside. Many houses have multiple return vents or HVAC systems. Each vent or system will typically have at least one air filter. Be sure to check each possible location to make sure you have located all of your air filters. My home has more than one filter, now what? Many homes have multiple filters, but that’s not an issue. Once you select your filter grade and deliver frequency, you’ll be able to select the number of filters you will need for your home. Make sure your measure each filter if you do have more than one—sometimes they are different sizes. You’ll be able to select a different size for each filter. That’s it! Make sure you insert your filter following the arrows on the filter to ensure proper installation and air flow. What is the MERV Rating? MERV stands for Minimum Efficiency Rating Value. Ranging from 1 to 20, this value rates how well the filter captures and holds particles of different sizes. All of our filters efficiently remove finer particles and are recommended for residential use. 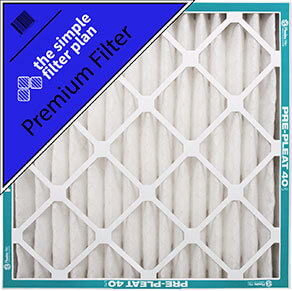 What Air Filters does Simple Filter Plan use? Our filters are made and manufactured here in the USA by Flanders Corporation, the largest filter manufacturer in America. Shipping is completely free! You’ll pay less than you would for a filter at a home improvement store, and you don’t even have to worry about getting there. We stand behind our 100% Guarantee. If you receive a filter that is damaged in any way or is the incorrect size, we will send you a new one, free of charge.